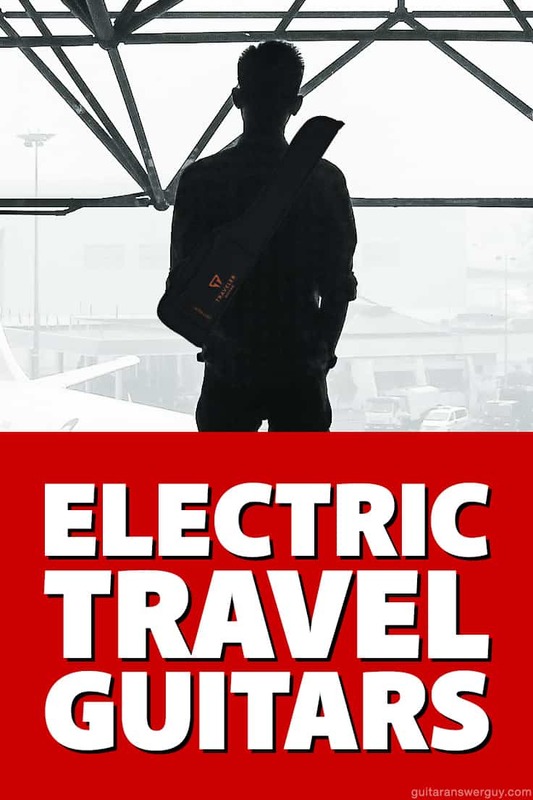 I need an electric travel guitar, so I’ve been doing a lot of comparison shopping online–feverishly reading Amazon reviews, watching YouTube videos, and soaking-up anything that’ll help me pick a little travel axe I can take on flights with me. Yes, I wrote a blog post on flying with a guitar awhile back, but I’d like to avoid the hassle and risk of taking my full-sized guitar on the airplane with me. Then, an idea hit me: Why don’t I document my search and turn it into a quasi “product comparison” post for my readers? 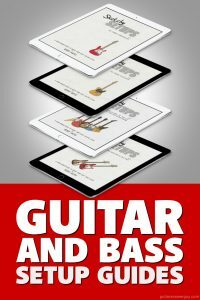 So, in this post I’ll show you my top 3 final contenders–the electric travel guitars I’m actually considering–and then conclude by telling you which one I decided to buy. There aren’t many reviews of this guitar on Amazon which isn’t necessarily a bad sign, but it means I have less information to base a decision on. This guitar is the longest of the 3 candidates–a downside of the full 25.5” scale, 24-fret neck. I’m very suspicious of the placement of the output jack–it seems like it could be problematic. I also worry about the positioning of the tuning pegs, though all the reviews I’ve seen and read say they’re a non-issue. The fact that this guitar has no body whatsoever concerns me a little, because I like to anchor the pinky of my picking hand on the guitar’s body just under the strings. No body = no anchor point. 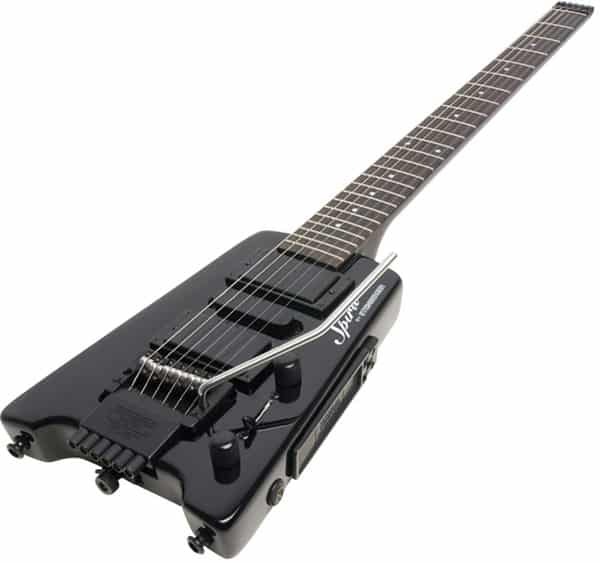 The first thing that jumps out to be about the EG-1 Blackout is the beefy Seymour Duncan Devastator humbucker. I might actually like this humbucker and not have to replace it. I love the fact that this guitar is more than 3 inches shorter than the Anygig AGE, despite having a larger body. Speaking of the larger body, I actually have room to anchor my pinky below the strings. I like that the output jack is in the traditional spot, unlike the previous guitar. I like the position of the tuners on this one too–there’s no way anything can accidentally bump them during play. Lastly, I really like the “blackout” look of it–very “metal.” Jumbo fretwire is also a big plus (for me). There aren’t many reviews of this guitar on Amazon. Again, that just means less info for me to base a decision on. It’s really odd that this guitar only has 21 frets. This guitar includes many extras that I really don’t need or want in a travel guitar like volume, tone, headphone jack, aux jack, and an on-board preamp that creates overdrive and distortion sounds (which I’ve heard and am not impressed with). These extras are why the price tag is so high on this one–putting it at the absolute top of my price range. I’m still intrigued though, so it’ll stay on my list of final contenders. This guitar has a good number of reviews on Amazon, and most are very positive. At only 28 inches, this is the shortest guitar of the 3 and to me that’s a good thing. I love that this guitar doesn’t have any unnecessary extras–no volume or tone controls, nor any on-board effects, headphone jack, etc. which just add bulk and weight to the guitar. I like that fact that this guitar has 22 frets. Like the other Traveler guitar, I like the position of the tuners on this one as well–out of the way. Despite the tiny body, there’s just enough beef below the strings for me to anchor my pinky while playing, unlike the Anygig guitar. This guitar comes with a detachable leg rest too, which elevates it on your leg a bit when sitting. This guitar is priced in the middle of the 3 contenders… higher than the Anygig, but lower than the EG-1 Blackout. It’s right in my sweet spot, price-wise. According to the specs, this guitar has “medium” fretwire. I’ve only ever played jumbo fretwire, so I’m not sure how medium will feel or if I’ll like it. The dual-rail mini-humbucker gives me pause, because I always replace factory pickups in my guitars, and a mini rails humbucker gives me fewer aftermarket options. 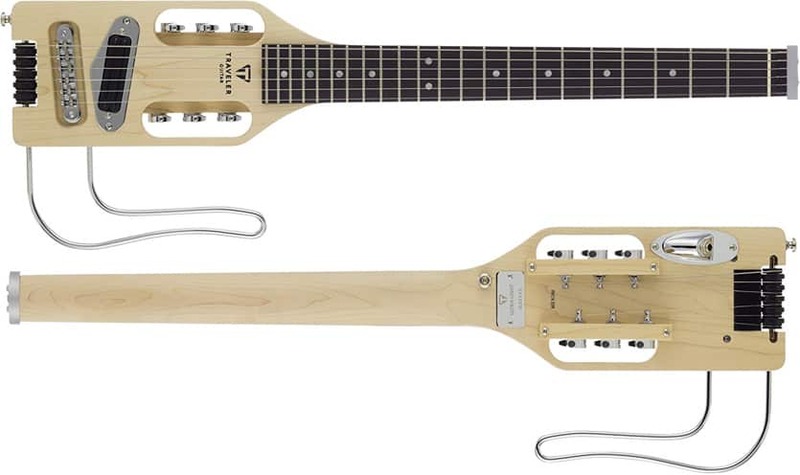 After carefully considering the three guitars above, I feel that the Traveler Guitar Ultralight is the one that’ll meet my needs and be the perfect little electric travel guitar. Sure, there are tradeoffs with all 3 models, but the Ultralight required the fewest number of compromises. It’s affordable, super light, and very tiny… while still having a 24.75″ scale length. I also really like the fact that it doesn’t have volume or tone controls; I just don’t need ’em. Even better, they have a matte black version, which I’m always partial too. I have to be honest, the Steinberger Spirit GT-Pro was the first guitar I thought of when I decided I needed a travel guitar. In fact, I wasn’t even going to research alternatives–I’d already made my mind up that it would be the Spirit GT-Pro. However, after seeing what else was out there, I decided that the Spirit GT-Pro was too heavy (7lbs), too fully-featured, and too expensive for my purposes. It’s just too nice of a guitar for something I’ll only play a few hours each year. 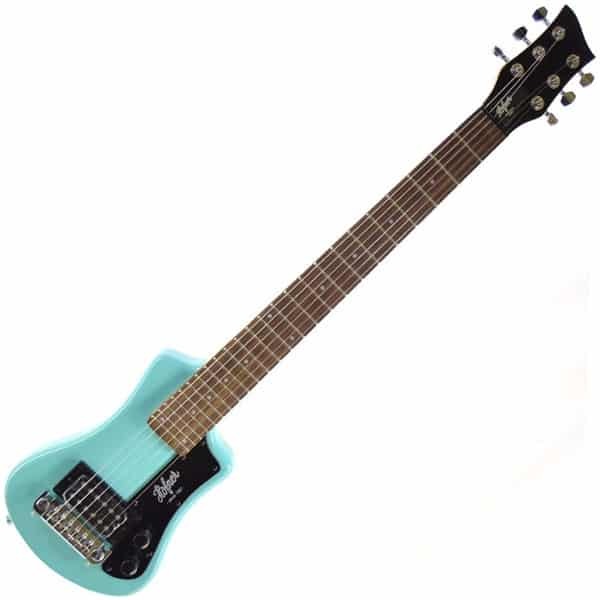 The Hofner Shorty would’ve been a serious contender for me except for the fact that it has a headstock, which makes it longer than what I was looking for. Also, having the volume and tone controls right there under my fingers when playing is a no-go for me. However, this is otherwise a great little travel guitar. If the headstock and controls don’t bother you, definitely check this one out. Strobel makes some great electric travel guitars, but they’re well above my price range, which is why they weren’t a contender for me. 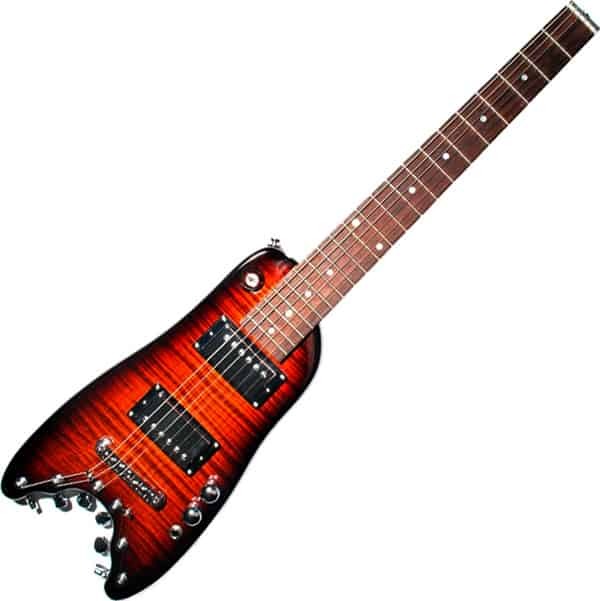 However, if you have a bigger budget for a travel guitar, then you should give Strobel serious consideration. Strobel even offers a semi-custom option, where you can specify your finish, woods, electronics, etc. Another great travel guitar with high-end features and many, many models and options to choose from. 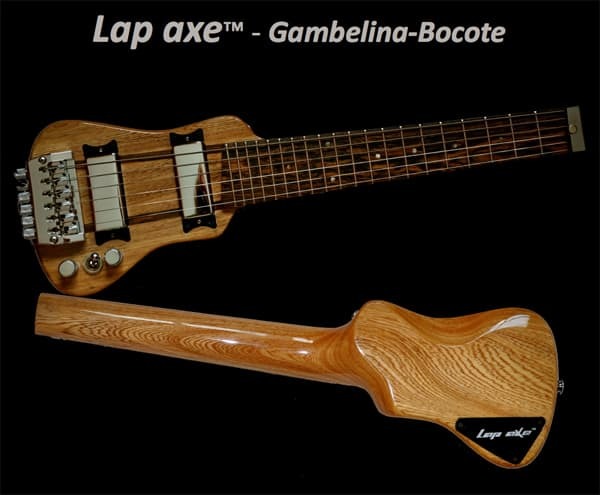 However, like the Strobels, Lap Axe guitars are simply out of my price range. But don’t let that stop you. If you’ve got a higher budget for a travel guitar then check out Lap Axe’s website, browse their models, and maybe you’ll find something that’s perfect for you. Do you own a travel guitar? Or, maybe you’re currently shopping for one? If so, I’d love it if you told me about it in the comments section below. Since I’ve owned not fewer than 10 travel guitars, I’ll add some input. Most of what I’ve used comes from the Traveler Guitar brand Escape and MKIII series. The EG2 strat-style seemed to have more trouble staying in tune than the others, but that was improved by switching in locking tuners available from the Traveler website @ around $60. I also have a couple Early Winters 1 piece acoustic backpacking guitars. These were made at an Ovation plant in Korea 30 years ago. One of them is outstanding in terms of playability and holding tune. The other suffers from having been on too many camping trips. Rare, but you can find them for $100 or so. All things considered, my favorite is also the smallest and most expensive – the Lapstick. It has a rock solid build, stays in tune, has a maple fingerboard and a switchable end plate that lets you add (or subtract) an on-board pre-amp. It wasn’t cheap, but the key thing for this and all the other travel guitars discussed on this board is that getting them in used condition is a great option. Nobody uses these as main guitars, so they spend a lot of time in the case, not getting played and maintaining their value. Definitely check used guitar sites and auction sites to reach a bit higher on quality. Thanks for your article. I have an older Speedster model made by Traveler Guitar. Overall it is a very handy item to have for keeping up my chops while traveling, especially as a airplane carry-on. However, even the slightest amount of string bending puts it out of tune which for me makes it unusable at a gig. I saw a post from someone at the company that said this is an inherent problem with their design. I would love to hear from owners of other travel guitar brands regarding their experiences with keeping their guitars in tune. I bought a Traveler Ultra-Light. Tuned it up, bent a string, it went out of tune. Rinse-wash-repeat. Lubed everything and it didn’t help. 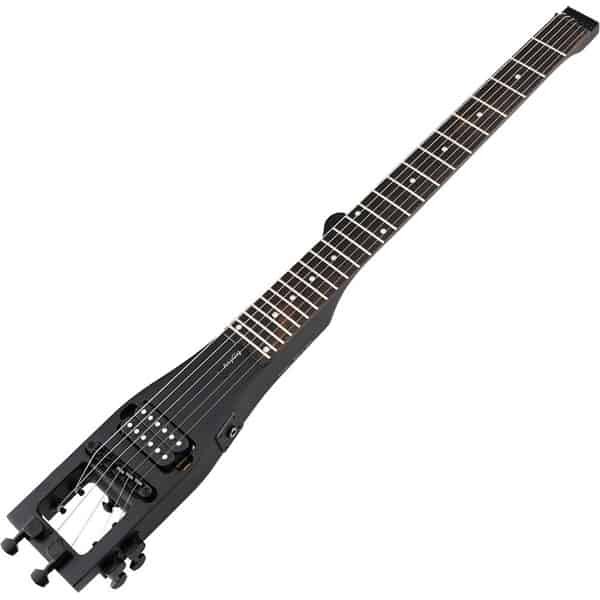 Gave up and returned it and bought a Steinberger. Yes it’s heavier, but not really any longer and most importantly it stays in tune with any bend! Haven’t travelled with it yet, but I don’t see it being a problem. How, thanks for the informative post. I’m not a metal player, and love playing more melodic etc. Budget around the same as yours, up to about 500 usd max if it’s something super nice. I would like to be able to use it to record music too as well as option for gigging would be great. Which one would you recommend for that then please ? There’s a good variety of really great guitars on that page, and all are right around $300. Bill here from Lap axe. We would very much like to thank you for giving us honourable mention in this article. Indeed we are a bit pricier than many. One reason is that we use very high quality wood and hardware, without any cost saving short cuts. Also we have a very stringent quality control standard, in that each axe is thoroughly checked over and often times set up personally by our CEO before we send each one out. We have looked at a more cost effective plan through mass production etc, but decided that our goal was always to build the best quality instrument possible and never want to jeopardize that mission. Thanks again for your positive comments and we hope once you have saved your pennies up, that you consider adding one of our axes to your collection. Hi Bill, thanks for the comment and you’re welcome–I’m glad to list Lap Axe. I tell ya what, I’m still searching for someone to make me a 7-string travel guitar. If you think that’s a possibility, definitely drop me a line. Bobby, I was just searching articles for the best travel guitars and was happy to see you gave Strobel Guitars an honorable mention for our Rambler Classic Professional Electric Travel Guitar. The Rambler does cost a little more than the competition, but they are well worth it. A genuine “gigable” guitar that is easily disassembled to fit in your computer bag when traveling. Thanks for the comments Russ. I’m happy to mention your guitars, because they’re cool little axes. If I ever do a general “roundup” type of post for electric travel guitars you can be sure Strobel will be there. 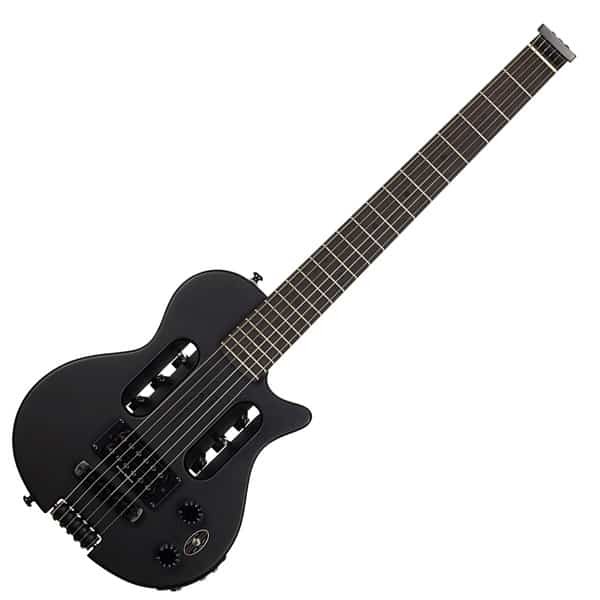 By the way, I’m still searching for someone to make me a 7-string travel guitar, so if you think that’s a possibility, definitely drop me a line. Hello, and thanks a lot for your article. I am looking for a nylon string travel guitar, and I was also looking for the Anygig (nylon version), do you have any suggestions for nylon travel guitar with similar needs like you mentioned for the electric ones? many thanks! You’re welcome Mag! Let me know if you have any questions. You can leave a comment here, or email me directly using the contact form here on the site. Cool article. Did you get the Ultralight yet? I picked up an Escape EG-1 Mahogany in satin red back in 2008 when I was doing a lot of traveling. Definitely comes in handy. I used to bring along my PODxt and some headphones. Everything fit nicely in the case and in the overhead bins. I wasn’t worried so much about getting the “perfect” travel guitar so much as something with just strings and frets that I could continue practicing on; keep the fingers moving, work on picking, etc. I would probably never use it in a gig situation, especially since keeping it in tune is VERY finicky. Hopefully your Traveler does not have that issue. I haven’t ordered it yet, because it’s so hot here in Arizona right now that things like guitars can be damaged by the heat during delivery (it can get up to 140F in the back of UPS/FedEx/USPS vans). So, I’ll wait till about October, when our temps begin to dip back into the low 100’s and 90’s. I’ll use the Ultralight + my iPhone apps (JamUp, Bias, etc) as my travel rig. Like you, I don’t plan to do anything too serious with this guitar–it’s mainly just to keep my chops up, maybe record ideas/inspiration when they hit, etc. 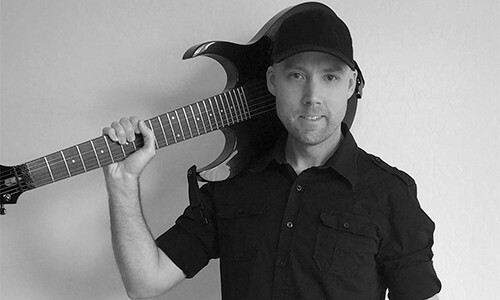 Guitar Practice: How to Beat Procrastination and Drudgery How Do You Find Time to Play Guitar?